We would like to welcome John and Mindy Fredrikson to the Gunflint Trail as the new owners of Gunflint Lodge and Outfitters. We haven’t met them yet but look forward to getting to know them and their family. They are beginning a new era on the Gunflint Trail one where a Kerfoot no longer owns the vast piece of shoreline on Gunflint Lake that contains Gunflint Lodge. Gunflint Lodge was started in 1925 by Dora Blankenburg and her son Russell. Mae and George Spunner were neighbors of Blankenburgs in Illinois and bought the lodge from them in 1929. Her daughter Justine was enlisted to help with the resort and eventually married Bill Kerfoot in 1934. Since then a Kerfoot has owned and managed Gunflint Lodge up until a week or so ago. Justine and Bill had three children before they were divorced in the late 1950’s. Bruce Kerfoot is one of the three and he along with his second wife Sue helped run the resort throughout the years. There was a brief period of time when each of Bruce and Sue’s children attempted to take the helm at the resort but that didn’t last for long before Bruce and Sue were back in charge at the lodge. 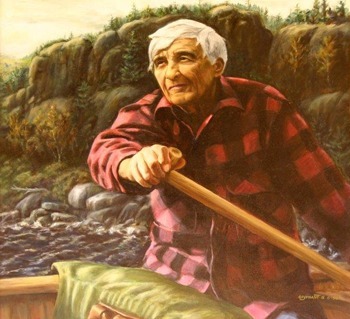 Bruce and Sue made many contributions to the Gunflint Trail community over the years. Both were involved in the volunteer ambulance service, served on tourism boards, helped grow winter business on the Trail and worked tirelessly on helping to create Chik-Wauk Lodge Museum and Nature Center. I am guessing they will continue to be involved at some level but life as resort owners is over for them. What an incredibly strange feeling it must be for them to no longer have that title as their identity after all of these years. We wish them the best in their new adventures.